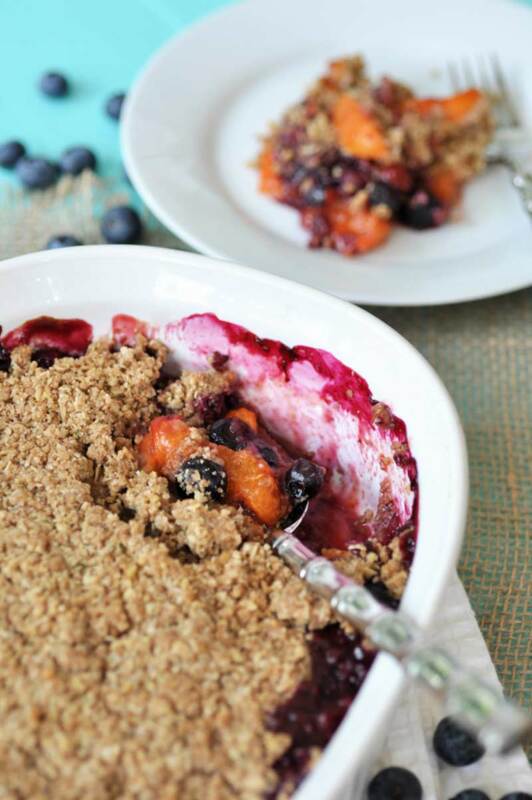 Few things sing summer like a vegan blueberry apricot crisp. 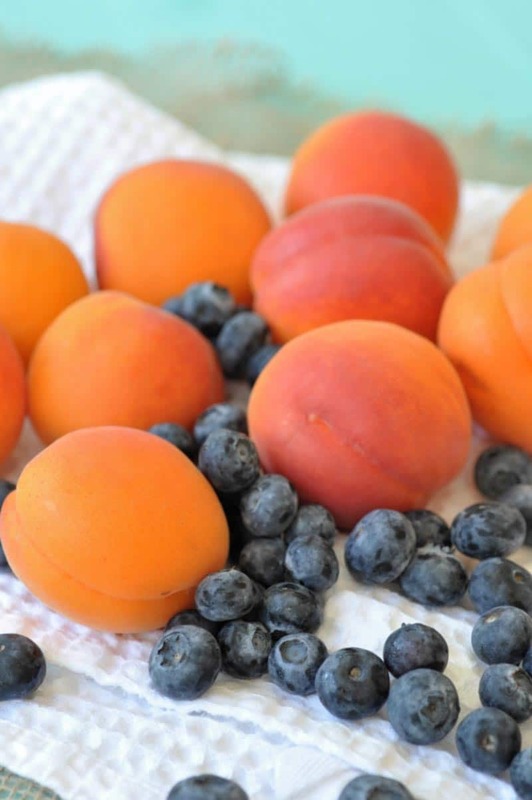 Stone fruit, such as plums, peaches, cherries, and apricots are at their peak right now, as are the jewels of summer, blueberries. As much as I love eating these perfect fruits as they are, it’s so much fun to turn them into an easy and delicious dessert. For this crisp I chose apricots because my local Costco had tons of these gorgeous organic beauties. They also had huge containers of organic blueberries; I couldn’t resist. 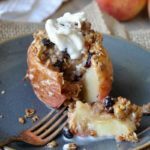 You could swap out any stone fruit that you like for this recipe, but I encourage you to make this with apricots because they add a zingy tartness to the flavor. Independence Day has come and gone, and now we’re into the thick of summer. You’re probably trying to enjoy every bit of outdoor time that you can get, and the last thing you want to do is turn on your oven and spend time in the kitchen. I hear you! 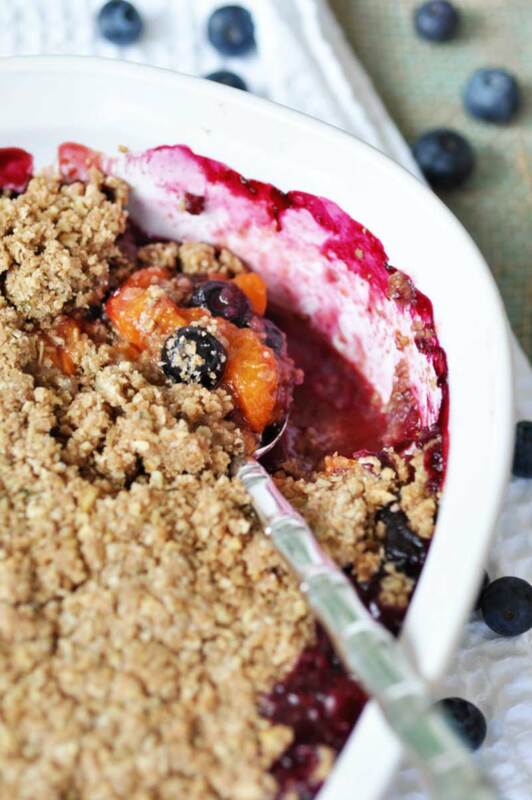 Just hang with me though, because this stone fruit and blueberry crisp, or crumble (call it what you will) is SO worth the little effort and time that it takes to make. Because we’re all watching our girlish figures so we can feel good about ourselves at our local watering hole (pool or beach, not bar), I’ve cut the sugar, swapped out regular flour for whole wheat flour and oats, and added walnuts for protein and crunchiness to this fruit crumble recipe. There’s also a big surprise in the topping. ROSEMARY! Yes, you read that right. I chopped up some rosemary leaves to add a little savory bite to the sweetness of this dessert. 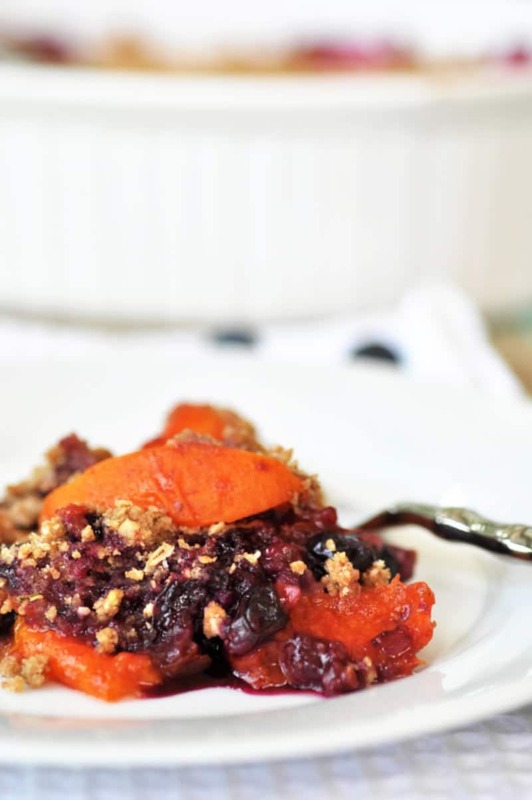 You’re going to love the subtle little extra something that it gives to this vegan apricot and blueberry crisp recipe. You’re also going to need corn starch, cinnamon, sea salt, and water, but I’m going to assume that you have those things on hand. No need to add to the list. This is so easy. All you’ll need to do is cut the apricots in half and remove the stone, then slice them about a half-inch thick and put them in the baking dish. Add the blueberries, coconut sugar, lemon juice, cinnamon, and corn starch, then gently fold the ingredients until the sugar dissolves and the mixture looks like this. Put the flour, walnuts, oats, rosemary, vegan butter, coconut sugar, cinnamon, sea salt, and water in a food processor and pulse until the mixture is crumbly and you can press it into a ball. Spread it evenly on top of the fruit and press it down until it looks like this. 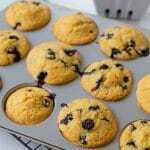 Bake it for approximately thirty minutes or until the topping is golden brown and the fruit is bubbling. It should look like this. Now dig in and enjoy one of the many joys of summer. 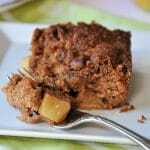 Notes on the Coconut Sugar: I used coconut sugar because I like the flavor of it for this recipe. Feel free to use whatever sugar you have on hand. You could also use maple syrup, but it will change the flavor of the original recipe. Notes on the Topping: You can omit the nuts if you’re allergic to them. 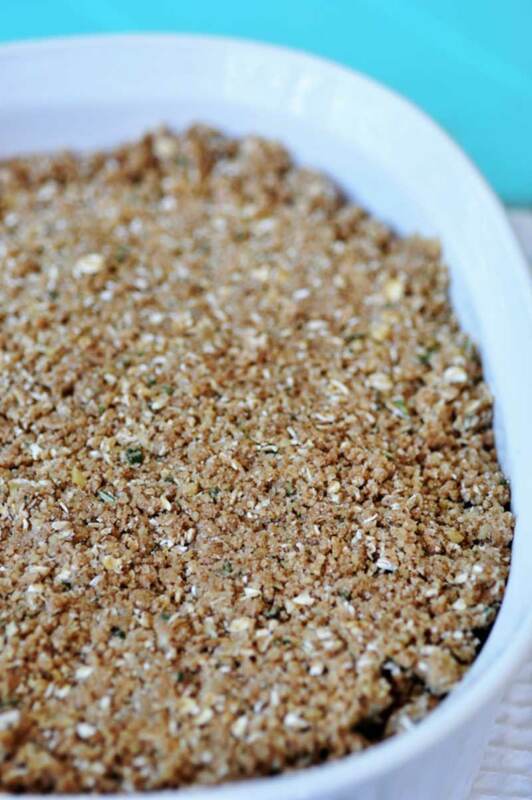 Feel free to add another nut or sunflower or pumpkin seeds to give the topping a little crunchiness. Notes on the Fruit: You can use any stone fruit that you like. Peaches, plums, or cherries will work just fine. 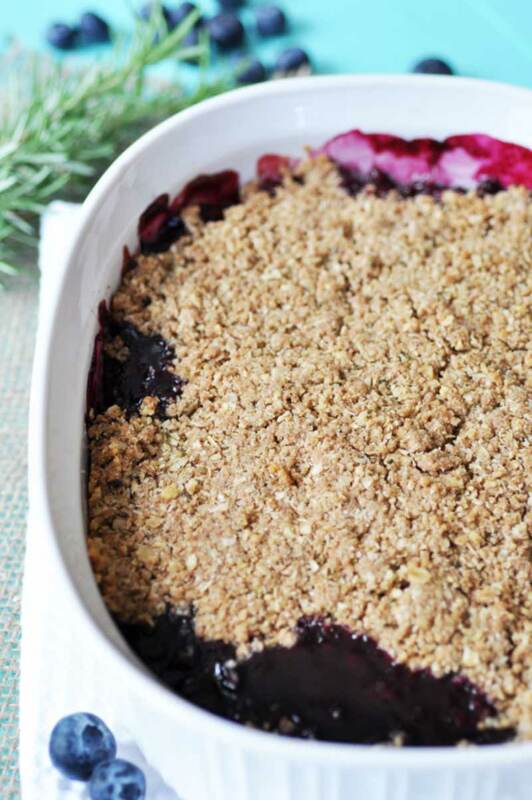 Notes on Eating this Apricot and Blueberry Crisp Dessert: If you want the crisp to set you need to let it cool completely. If you want to eat it hot make sure you add some vegan ice cream on top. So good! Summer stone fruit, blueberries, and a crunchy topping with a hint of rosemary. A delicious and healthy dessert. 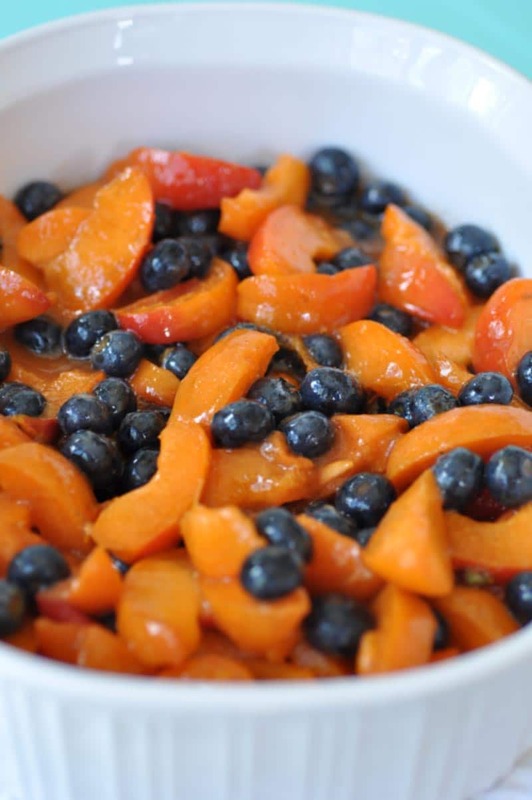 Put the apricots, blueberries, coconut sugar, cinnamon, lemon juice, and corn starch in a deep 9 inch baking dish and gently fold the mixture together until the sugar dissolves. Put the flour, walnuts, oats, butter, sugar, cinnamon, salt, and water in the bowl of your food processor and pulse until it’s crumbly and sticks together. Spread evenly on top of the fruit and pat it down so it’s firm on top. 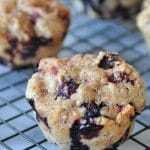 Bake for approximately thirty minutes or until the topping is golden brown and the fruit is bubbling. Let it cool for at least ten minutes before serving. Costco is getting better and better, especially with their organic section. Yum, I love peaches; you were a lucky kid! Oh how I wish I had a pint of ice cream when I made this crisp. Such a bad move on my part. Thanks, Natalie! I adore the fruit and veggie selection from Costco, the organic options keep getting better. And this looks amazing! Thanks! What a lovely delicious oraganic fruity breakfast... healthy and quick to make as well... just awesome. 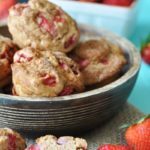 I think you just invented the PERFECT summer dessert! I can't tell you how much I want a bowl of this with a scoop of ice cream right now, for breakfast! I'm loving all the deals on blueberries right now too, just filled my freezer with bags of 'em. I can't not buy blueberries at these prices! LOL! I wish I could take credit for inventing the crisp, I can only take credit for my version. I thank my mom for introducing me to this lovely treat. Blueberries are so amazing right now! A good summer crisp is always a good idea! I literally could devour that entire thing in one sitting. 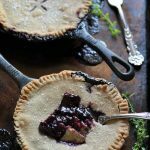 I'm more of a crisp than pie person to be honest because I love that crumbly topping. Looks amazing Linda! Oh, trust me, I had a hard time staying away from that pan. Thank you, Sophia!